Today, I got the joy of switching our internet and DISH over to something else. The process started at 9am and ended sometime after 5pm. The current company cut our DSL off one day early and in the process seemed to lose our email addresses. Anyhow, it's all back, including the email addresses, so hopefully all is good, but I *hate* being offline all day, especially when our phone only works when the internet works. So, I finally can post Faith's rather cute Rainbow-Butterfly bento! She had a cream cheese and jelly sandwich on Nature's Own Honey 7-Grain bread, which just might be my new favorite bread ever. 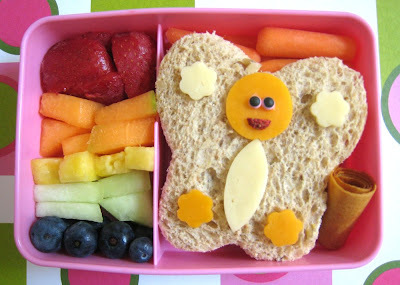 It's cut with a butterfly LunchPunch and topped with cheese decorations, two sugar eyes and a dried strawberry smile. Above the sandwich are some baby carrots and to the right is a homemade peach & apple fruit roll up (all natural, it's peach & apple & that's it, made with my awesome new food dehydrator). To the right is a rainbow of fruits--strawberries, cantaloupe, pineapple, honeydew, and blueberries. Perfect for my girl! Yay! Welcome back to the online world. Love your rainbow fruits too! I'm a newbie, so maybe this is common knowledge, but do you hand make all the accessories like the eyes, and what do you use to draw the faces on the eggs? That's super cute and simple. I'm impressed you can keep that many different kinds of fruit in the house without some of them spoiling. Of course now that I bought that dehydrator, like you, I guess I can pop it in before it goes bad! Love the "rainbow"!!! I need to know how you make those roll ups - my kids would LOVE them and they are perfect for when I have to pack some 'dry' snacks. very cute butterfly and nice color composition! so glad your internet is back to normal. can't imagine your situation, especially when you say "phone only works when the internet works" Eeekk...! Umm, will you be my mom?